Spring starts with fantastic release from Sesame Workshop and Warner Bros. Home Entertainment - Sesame Street: The Cookie Thief. Join two hours of fun with your favorite cookie loving monster! There’s an all-new cookie museum in town and your favorite furry friends are excited to start exploring! Cookie Monster leads the pack in this nail-biting, cookie-munching thriller that guest stars Rachel Dratch of Saturday Night Live fame and celebrates the arts. Sesame Street: The Cookie Thief is a fun, action-packed special in which Cookie Monster explores self-regulation concepts – such as impulse control, following directions, and managing emotions. Warner Bros. Home Entertainment and Sesame Workshop, the non-profit, educational organization whose mission is to help kids grow smarter, stronger and kinder, will release Sesame Street: The Cookie Thief on Digital and DVD on March 1, 2016. In new Sesame Street: The Cookie Thief story a cookie art museum has just opened on Sesame Street. Surrounded by beautiful cookie paintings, like “Girl with the Cookie Earring,” and the “Muncha Lisa,” The museum is full of excitement with learning opportunities around each corner. Cookie Monster and his friends feel like they’re in a whole new world. But when art suddenly starts to disappear, Cookie Monster quickly becomes a suspect. Can Cookie Monster clear his name? Will they find the missing art in time, or will Cookie Monster be banished from the museum forever? Cookie Monster continues to help preschoolers develop essential skills in creativity and imaginative play all while keeping children laughing and having fun. 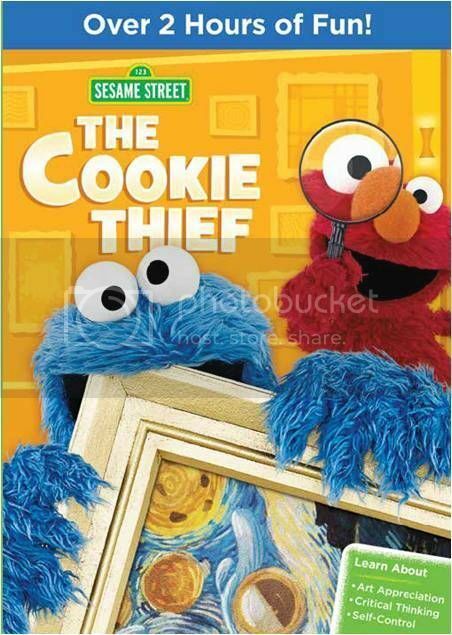 For our US readers we are excited to give away a copy of The Cookie Thief DVD to enjoy favorite Sesame Street characters including Cookie Monster thanks to Warner Bros. Home Entertainment. The giveaway ends March 14, 2016 & is open to US residents only (no P.O. Box, please). I would love this for my son. He likes Sesame Street and I like that he learns from Sesame Street. Our little guy would love this. He loves watching Sesame Street, particularly Elmo and Cookie Monster. i would like to win for my sister's little one!